Do you need a blank 512-byte file, a 1.44MB floppy disk image, or want to quickly generate a 100-gigabyte "filler" file to see how your computer responds when out of disk space? On Linux, you'd accomplish all 3 using the dd command. On Windows, however, such a command does not exist. 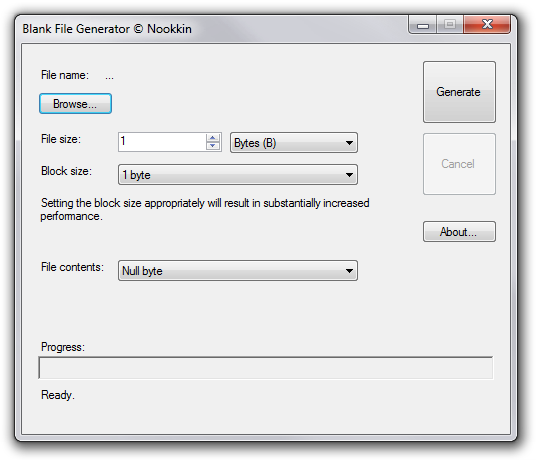 Blank File Generator will generate a file on any writable disk, including a hard drive, USB flash drive, memory card, floppy, RAM disk, or network share. It can generate a blank file (filled with null or filled bytes), a text file full of spaces, or a random file. File size can be specified in all popular units, including bytes, SI kilo/mega/gigabytes (powers of 1000), and standard kibi/mebi/gibibytes (powers of 1024). If you want to make a file that fills a drive with an advertised capacity of 4 billion bytes, for example, you can simply specify "4 SI gigabytes" instead of manually converting to the "true" gibibyte capacity. You can specify a block size ranging from 1 byte to 256 MB; this is how much data is written at a time. This can greatly improve performance if set properly. Aim for the largest block size that will comfortably fit into RAM without paging; bigger is not always better. Blank File Generator requires no installation, and only requires that you have the .NET Framework 2.0 installed on your system. Oh, and did I mention that it doesn't cost a cent? 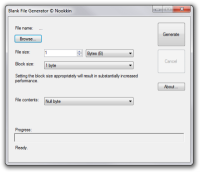 You are allowed to use Blank File Generator with virtually no restrictions, i.e. you may use it for both private and commercial settings free of charge. However, you may NOT use this software as part of your own projects or compilations without permission from the developer. Dude - this is really nice... but why is the text box restricted to 4096? I wanted to write 5587822567424B - there's no way into coerce it into doing that (also I can't simply put 5.08TiB)... Have you thought about maybe making it less prohibitive?